I just spent nearly two hours walking in silence with a group of strangers. 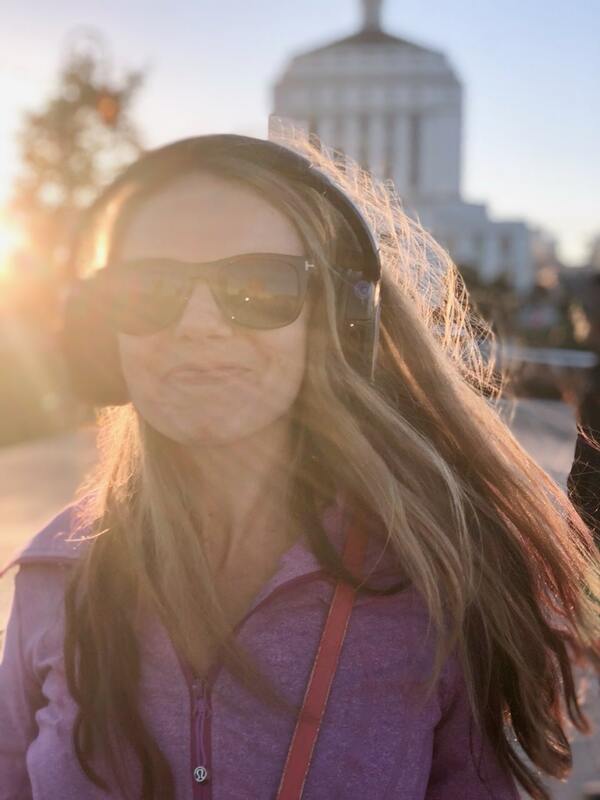 While this sounds like it might be some form of meditation (and in fact, it sort of was), it was actually a walking silent disco. This event was part of the new series of “FieldTrips” offered by the folks who put on CreativeMornings. Here’s a quick rundown of the evening. 5:45ish: DJ Moxie explains our route, recommends we stick together, and heads up the group. The silent disco walk commences! There were a couple of moments where I stopped to think, “This is basically what I do all the time. Walk and listen to music.” But there was something special about being with a group of people, knowing that we were all listening to the same music. 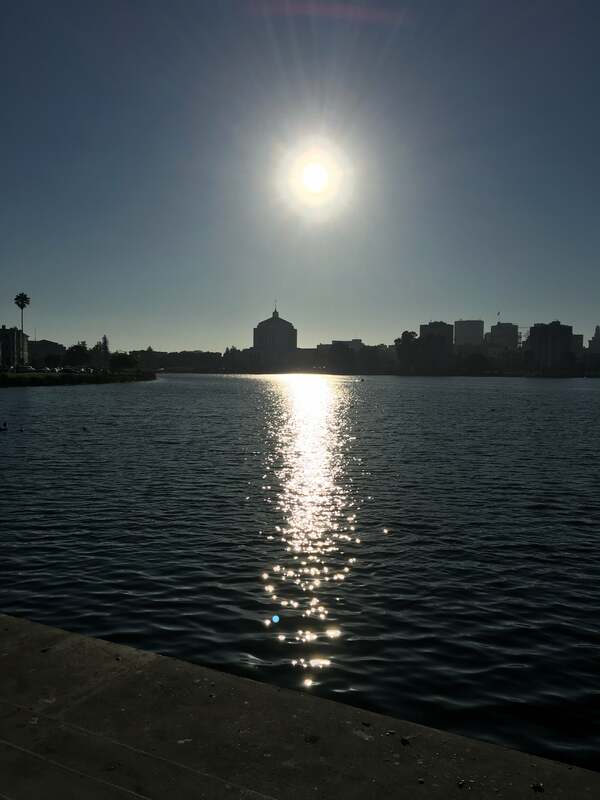 It was also a perfect Oakland evening, the sun keeping us warm, and the lake providing a beautiful backdrop to our experience. There were dogs out for walks (oh so many dogs! ), people out for runs, youngsters doing crazy tricks on their bikes, geese and egrets and pelicans (oh my! ), and other people going about their lives. The people we encountered felt like a microcosm of Oakland itself, with different ages, socioeconomic backgrounds, and races represented. What I liked about this experience (other than the amazing tracks provided by DJ Moxie) was the fact that it was a subtle twist on activities I already enjoy (spending time outside, walking, listening to music, and dancing). AND there was the huge bonus of not having to talk to anyone while still being surrounded by other people. Mindfulness is a buzzword these days, and there’s a lot of pressure to be mindful, yet a lot of feelings of inadequacy around this concept. Whenever I go to yoga, I feel guilty when my mind races with inane thoughts during shivasana. Attempting to meditate yields the same results. Even in my Zumba classes, which I absolutely love, I sometimes find my mind wandering and daydreaming about being somewhere else. So this walk was a nice opportunity to stay present and grounded. 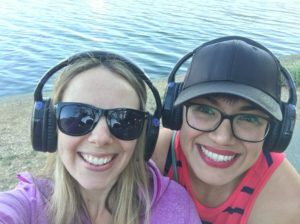 As with the other CreativeMornings events, the silent disco was a great reminder that I’m not alone. I’m part of a community of interesting and inspiring people who like to do cool things. And that’s definitely worth dancing about.